I’ve come across many families who are hesitant to look into Workamping because they have kids. While not a traditional hesitation for most employment opportunities, this is definitely one that couples and/or single parents face inside the world of Workamping! 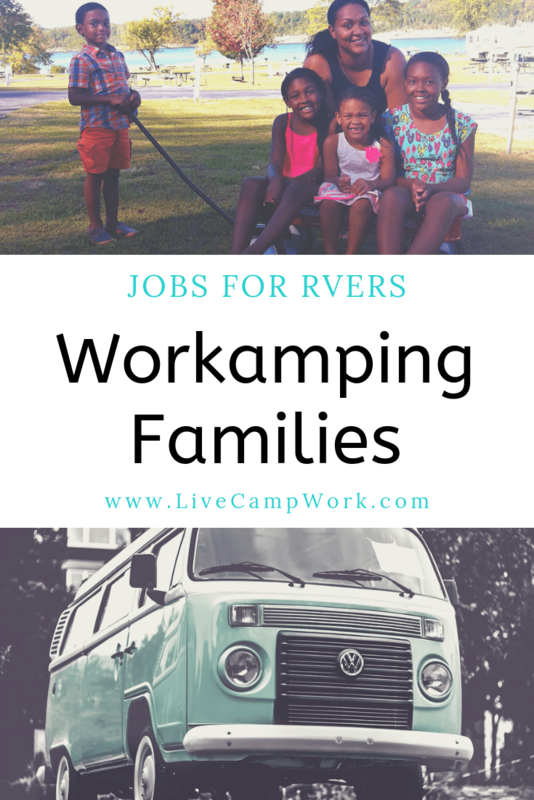 As a mother of 4 small kiddos- who has worked many seasons of Workamping jobs before going remote for Workamper News, I’m here to reassure you that not only is Workamping as a family possible, but it can be a fantastic adventure for all involved. Virtually any Workamping job can be well suited for families. Regardless of if you have 1 child or 11, small children or teens- as well as one parent or two, you will be able to find a variety of Workamping jobs to apply for. And as long as the park isn’t 55+, although I have heard of 1 couple who managed a 55+ resort with a family of 4, there really shouldn’t be an issue- so don’t approach it as one! Approach Workamping as a family like you would any employment situation, by applying to fill a position based on what is required. If the employer is hiring for a single position, and you can fill it- then apply. If they are hiring for a couples position and the schedule and shifts work for you, then apply. If the employer offers to allow your kids to help out in certain circumstances- then that’s an awesome bonus! Workamping families are more common today than they were just 5 years ago, when my family first set out. We’ve met multiple families traveling gin RVs working both traditional Workamping jobs as well as remote or location independent jobs from their RVs! Before you start accepting Workamping jobs with the intent of taking your kids along for the ride, there are a few tips I’d like to share with you to make your journey less stressful and as smooth as possible. Be Upfront: When looking for Workamping jobs, it is important to be upfront with potential employers that you will have children traveling in your party. Some campgrounds/jobs are not set up for families and you don’t want to spend your Workamping time in a place that you, your children and your employer are not happy. Do Your Research: Always research the employer that you are applying to and make sure it is somewhere that you would want to live. You’ll be staying for an extended time, so things like location, distance to facilities like hospitals, groceries, and gas will be important. Mention The Kids: When applying for the job, include a note or picture of your children on your resume or a followup email, so that the potential employer isn’t surprised. Don’t waste your time and theirs if they outright don’t want to hire families. Trust me there are plenty that will. Just keep looking! Be Positive: Be a positive voice when speaking about Workamping with kids! Your employer is going to reflect your attitude towards your children. If you start out by being negative, or assuming its an issue- then your employer will be watching to see if and when they step out of line. If you focus on the positive aspects of having children around, then that will be mirrored back by the employer towards them. Set The Rules: Everyone knows that children have their moments, as do adults, but don’t let those moments define who your children are. Set the guidelines and expectations well ahead of arrival and make sure to remind them of the rules throughout your employment. Setting the expectation of what is appropriate for when you are working and when you are off is a great way to start! There are many campgrounds that welcome and embrace Workamping families. Some campgrounds will even hire teens to take on tasks like helping younger children with daily activities and crafts! My family has worked at several Jellystone properties where this was the case. Although our kids were too young for this opportunity, many others were welcome to apply for summer jobs and earn a little cash for themselves! My single best tip for anyone looking for jobs for Workamping families would be to ask every employer! Every time you see a job that you have an interest in applying for, send an email with your resume and make sure to ask if there is an issue with you bringing your kids along. The employer will likely have questions as to if they would accompany you to work or if you will have childcare covered throughout the day. If you can answer these questions early on and make it easy for the employer- you have a great chance of landing the jobs you want!